Since 2014, CARTHA has provided a platform for critical thinking on architecture and society. Each year, CARTHA initiates research and publishes issues on a topic in its online magazine, which are then brought together in an annual book. In 2016, CARTHA was invited to participate in the Lisbon Architecture Triennale. Adopting the Triennale’s topic, “The Form of Form,” the three issues that comprise CARTHA—On the Form of Form explore the topic of form through different, yet complementary, lenses. The first issue, How to Learn Better, was edited by Bureau A and discusses pedagogical approaches to architecture. The second issue, The Architecture of the City, edited by Victoria Easton, Matilde Cassani, and Noura Al Sayeh, revisits and reinterprets Aldo Rossi’s writings on the form of the city. 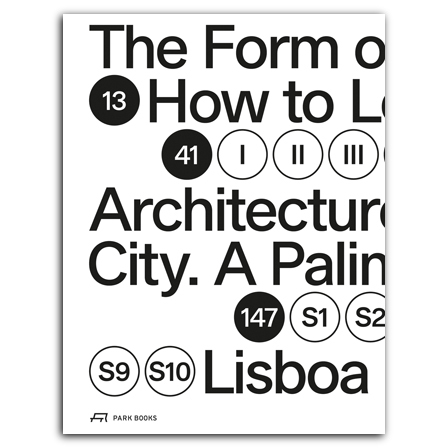 Published during the Triennale, the third issue, Lisboa Paralela, was edited by the CARTHA editorial board and expands on urban forms by questioning the status quo of natural and social laws and speculating on these through essays and a design exercise by some of the most interesting voices of the current architectural scene. With contributuions by Åbäke, Noura Al Sayeh, ALICE / Dieter Dietz, Amateur Cities, Annette Amberg, Pier Vittorio Aureli, Babau Bureau, Pau Bajet, Titi Balali, Patricia Barbas, Shumon Basar, Baukuh, Laura Bonell, Bureau A, Adrià Carbonell, Matilde Cassani, Ciriacidis Lenherer Architekten, José Pedro Cortes, Laura Cristea, Irina Davidovici, Andrea Alberto Dutto, Victoria Easton, Edelaar Mosayebi Inderbitzin Architekten, Mariabruna Fabrizi, Farquet Architectes, Simona Ferrari, George Foufas, GANKO, Cloé Gattigo, Stefano Graziani, Owen Hatherley, Studio Anne Holtrop, Sam Jacob, Manuel Krebs, Labics, Tristan Lavoyer, Armin Linke, Nicholas Lobo Brennan, Daniel López-Dóriga, Fosco Lucarelli, Lütjens Padmanabhan Architekten, Nikos Magouliotis, Walter Mair, Ahmad Makia, Martin Marker Larsen, MOS Architects, Nelson Mota, Johannes Norlander Arkitektur AB, Nicolò Ornaghi, George Papam Papamattheakis, Daniele Pisani, Pedro Pitarch, Philippe Rahm, Camilo Rebelo, Roi Salgueiro Barrio, Shirana Shahbazi, Daniela Silva, Giovanna Silva, Something Fantastic, Carolin Stapenhorst, Milica Topalovic, Gabriel Tomasulo, Luis Úrculo, URSA, Alejandro Valdivieso, Christian Vennerstrom, Wai Think Tank / Cruz Garcia & Nathalie Frankowski, Ala Younis, Camille Zakharia, Raphael Zuber, and Cino Zucchi.